If you’re as star struck for the celestial trend as we are, you’ll be over the moon with these five galaxy inspired looks. 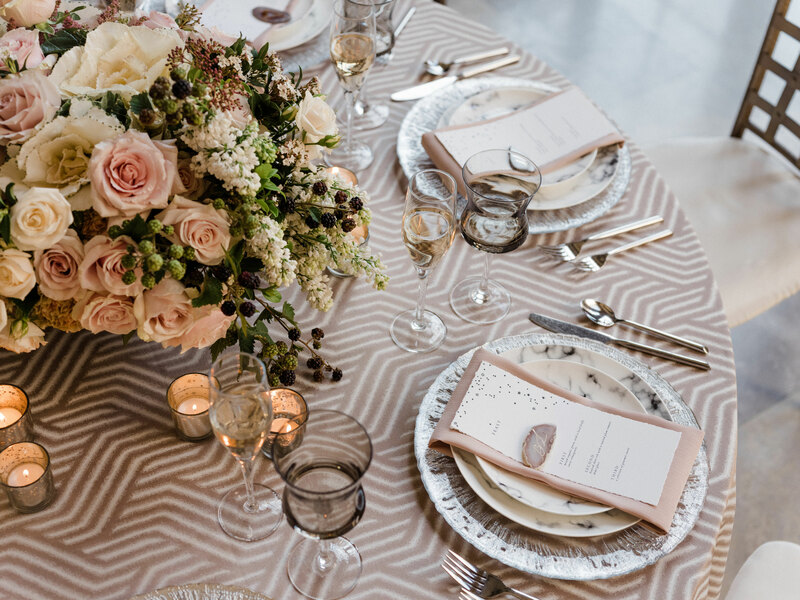 These looks are inspired by anything from the evening sky, deep space, stars, or astronomy–we’ve found our favorite out-of-this-world event looks for all you star-obsessed planners. Stargazers often find harmonious inspiration from the night’s sky and we can’t find a better muse for affairs focused on coming together and connecting. 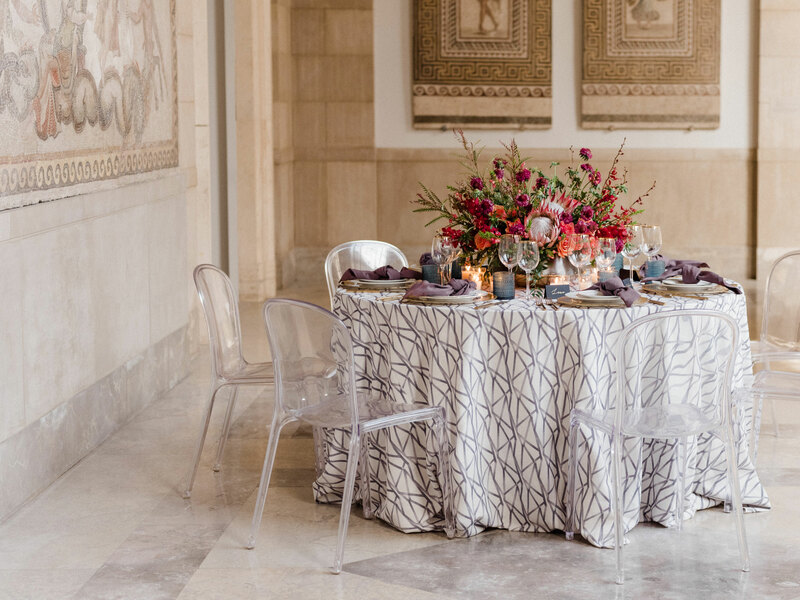 With constellation tracery and a nebula-inspired color palette, this modern tablescape is undeniably stunning. The combination of white, inky blues, pink, and a pinch of metallic tones sprinkled throughout give this cosmic look perfect balance. 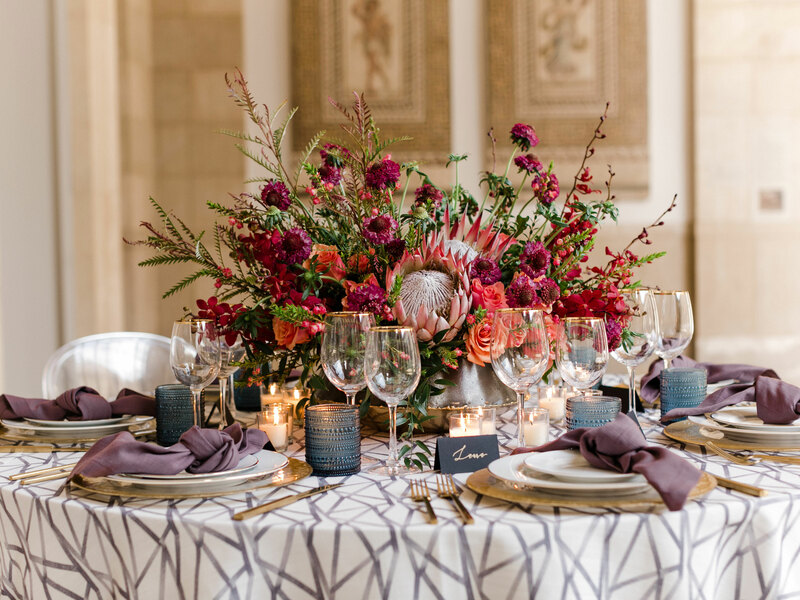 Bright blooms bursting outward, like shooting stars, are a heavenly final touch for this standout centerpiece. 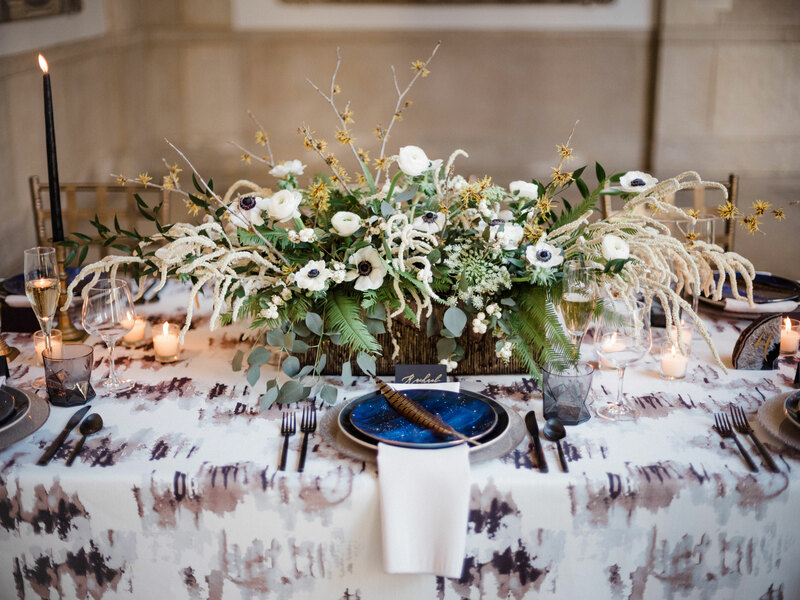 This tablescape perfectly captures the magical shimmering displayed by the northern skies, with its shades of blue, green, and pink. 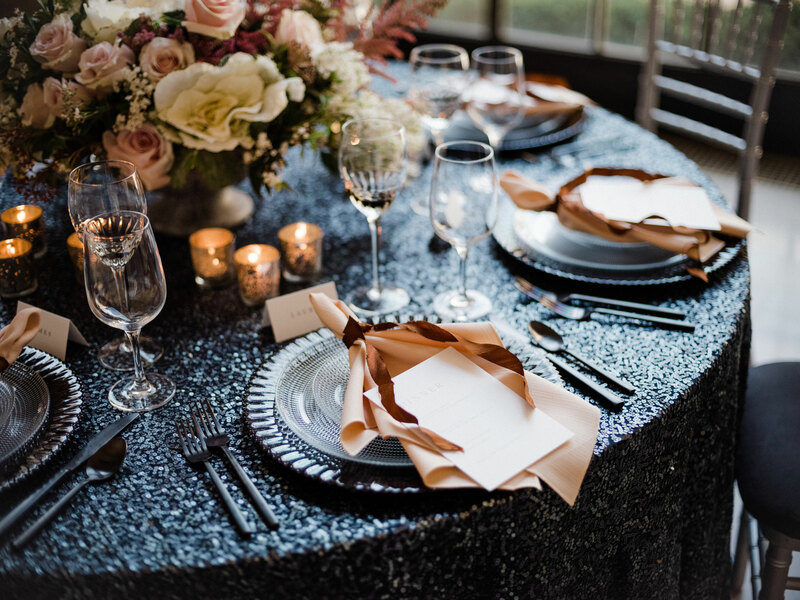 Glittering blue-green sequins blanket the table like an inky midnight atmosphere. Cream and pink tones add a light airiness to the design while creating a focal point for the copper silk framed menu. Mercury votive holders mimic twinkling stars and create a magical luminous display. 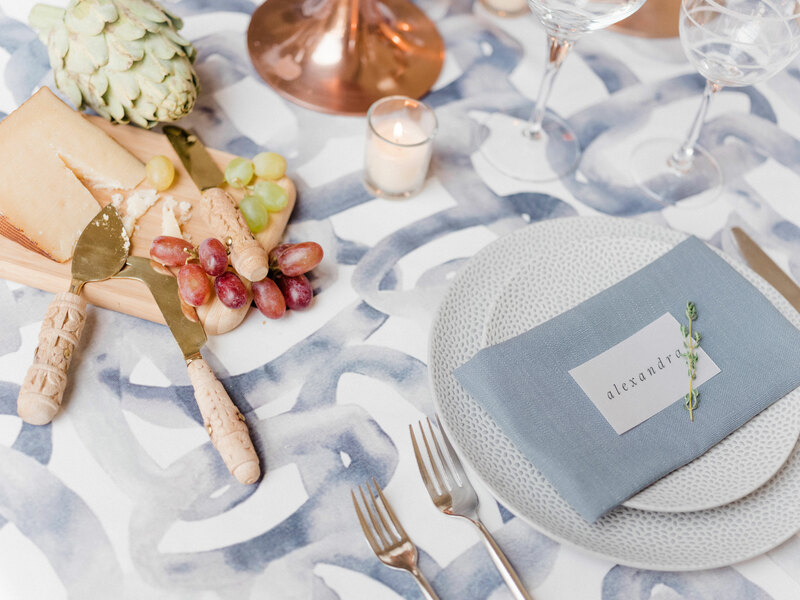 The interlocking ring pattern of this table linen was odiously the muse for this cosmic-inspired tablescape. 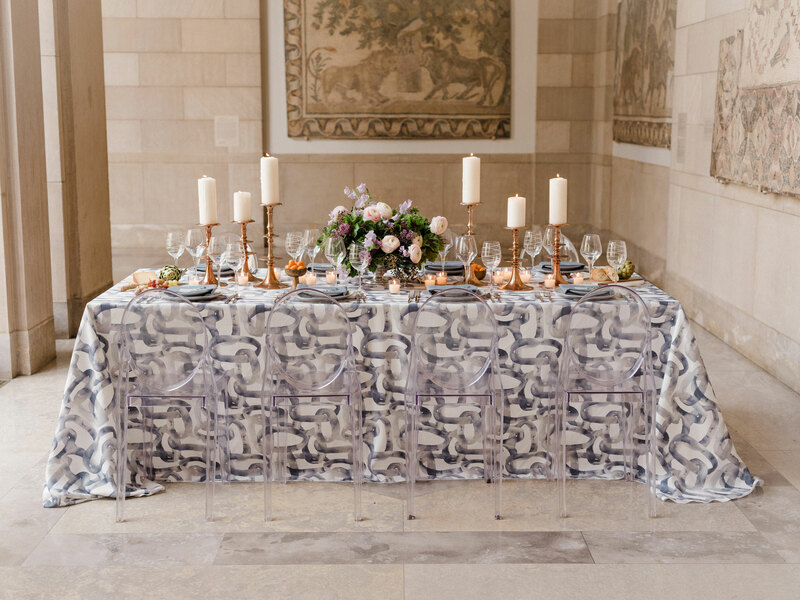 But the swirling orbs don’t stop there, they can be found everywhere from the polished copper candle towers to the etched glass stemware and even in the charcuterie board! Like a sky streaked with falling stars, this look is beyond enchanting. 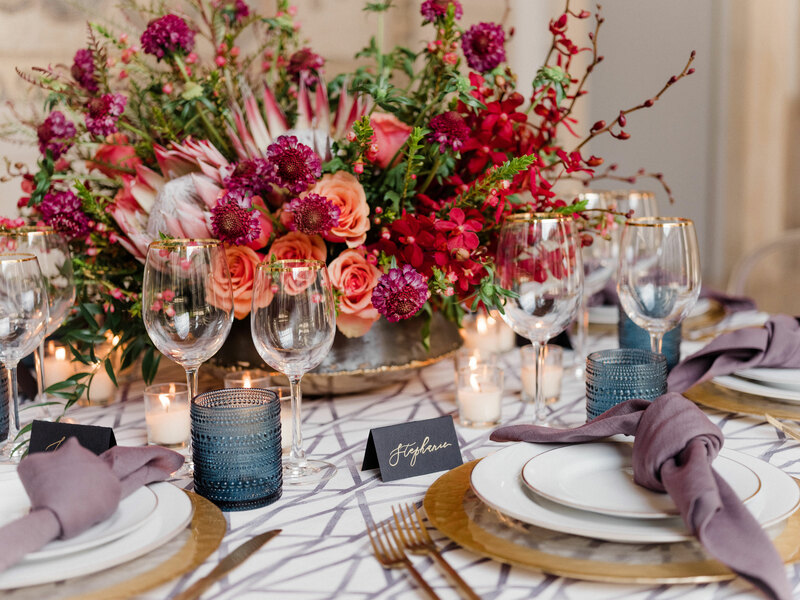 Moon dusts of florals hang over the tablescape and magical star-themed plates eclipse glittering charger plates, this look couldn’t get more whimsical. 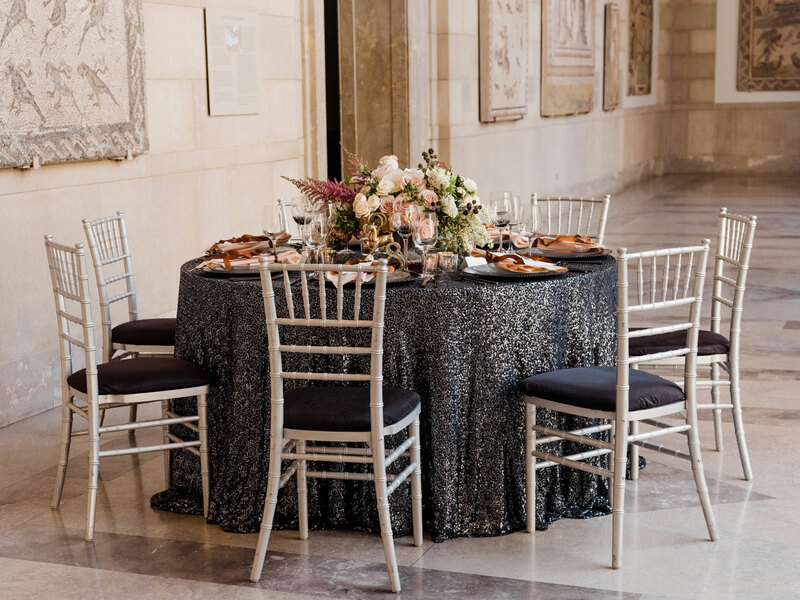 Tiny touches of black add drama and elegance. 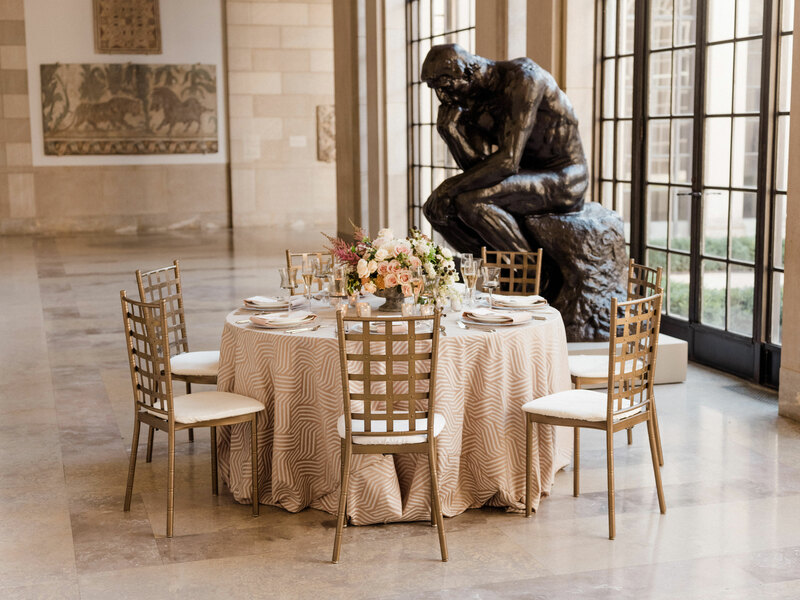 As the days get warmer and longer, this matte golden pattern is perfect for a summer wedding or special event. 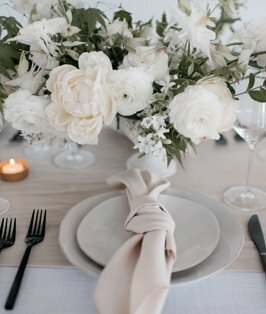 Blush tones pair perfectly with this very muted ivory and metallic table linen. 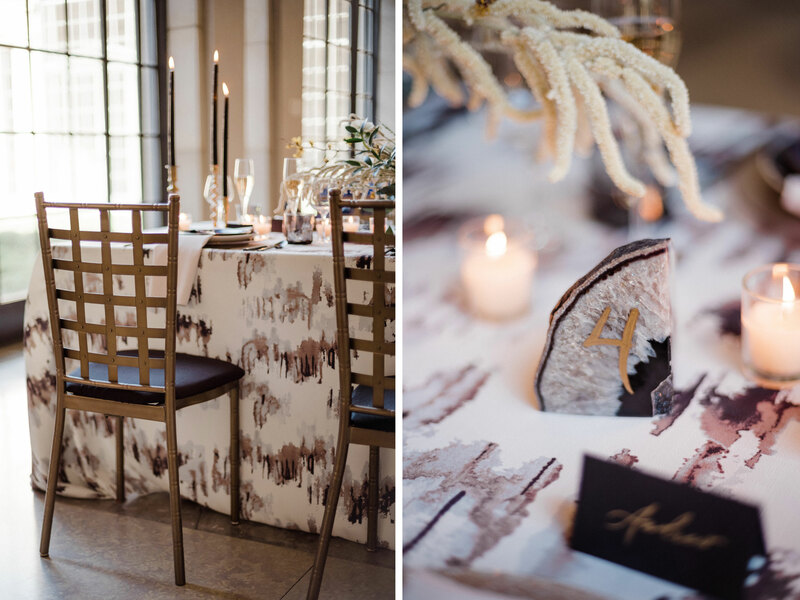 The silver leaf touches on the charger, layered with marble plates, give it a modern touch. 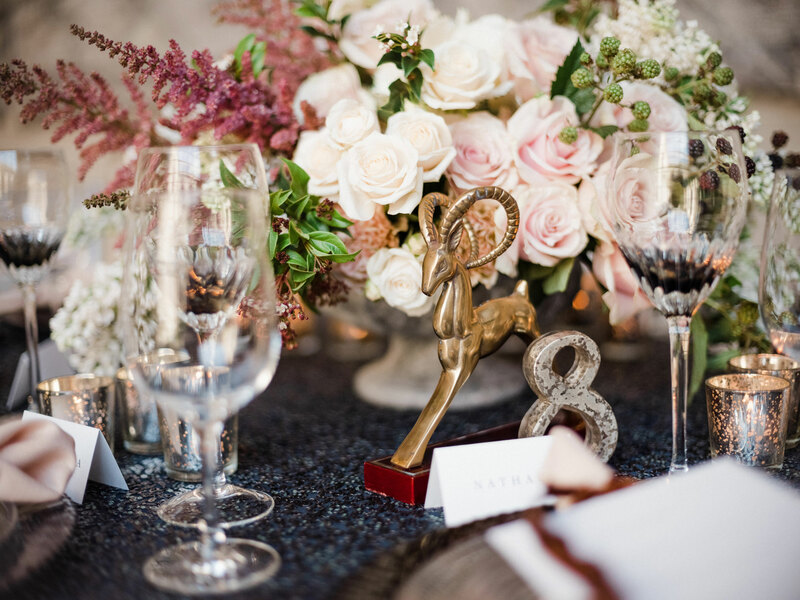 Not to mention the star-detailed menus, adding a subtle celestial touch to the table design. Need more star themed inspiration? Our Celestial Collection lookbook has even more starry sky looks!